The Terni district offers a wide variety of tourist attractions to suit many different interests. The main centre of this territory is the Town of Terni which, despite the destruction undergone during the last World War, has remarkable artistic and monumental evidence which date back from the Romans to the nineteenth century. The town, which has very ancient origins, is located on the confluence of the Serra river and the Nera river (the old name of the town, INTERAMNA, means a city between two rivers) and it extends over a flat basin, rich in water, surrounded on all sides by the rolling Umbrian hills. Among the remarkable touristic features of the Terni district are: the Marmore Waterfalls, an impressive Roman hydraulic work , which with its incomparable spectacle has inspired the creative genius of writers and poets. Also in the Valnerina we find small centres like Arrone, Montefranco, Ferentillo (with the San Pietro in Valle Abbey and the Mummy Museum) and Polino. Piediluco lake, a small sheet of water lying in the middle of the Umbrian hills, famous all over the world for the P. D'Aloja Nautical Centre, seat of the national rowing Centre which every year hosts national and international rowing competitions. Among the historical centers are Narni, interesting for its various monuments; Stroncone, a small, well preserved village which looks out over the Terni valley. Calvi and Otricoli are also interesting, the latter having remarkable archaeological remains of the Roman town. Finally we must mention the mineral water areas with the two pleasant centres of Sangemini and Acquasparta which preserve remarkable evidence of the past. Near Sangemini, along what was once the original Via Flaminia, we find the archaeological complex of Carsulae dating back to Roman times, the most important one in our region. Thanks to argoweb.it for the above description. 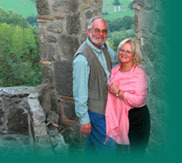 There are many wonderful places to visit in Italy, and we enjoy taking day trips from L'Avventura. We will try to document some of those, including places we've stopped to eat. It is the beginning of June, 2004. We decide to take a drive on a week-day to see the flowers of Castelluccio, an area near Norcia, in the northeasternmost corner of Umbria, just below Marche, in the Sibillini National Park. At about 9:30 AM, we drive down the Superstrada from Bomarzo to Orte, take the E45 North to Terni, and then take the cutoff through Terni on the S209 to Visso. The whole route from Terni to Visso is in the Valnerina. This is the valley of the Nera River, and the river is on our right for most of the trip. After leaving Terni, the first thing of notable interest is the Cascata di Marmore (Marmore Falls). If you enter the parking lot, you will find a visitors' center, where you can buy a ticket for a close view of the falls. On the trip toward Castelluccio in the morning, the falls are "just a trickle" but on the way back in the afternoon, the falls are "open" and rushed down over the rocks like a gushing torrent, with sprays of water causing it's own weather almost out as far as the road. These falls are among the highest in Europe, at 541 feet (165 meters). Created by the Romans, the water is now diverted to produce hydroelectric power. The falls can also be viewed from above, by parking near the Marmore village and taking a short walk. The Nera is the Tiber's largest tributary, and flows clearly and rapidly for almost 116 kilometers. In June the vegetation is lush, but the river is visible in many areas. In the winter, trees are bare and the river and its icy water are easy to see. This is a beautiful drive at any time of year. The road is a two-lane often winding road, so a trip during the week is advisable, unless you don't mind driving behind an ape or a slow poke. 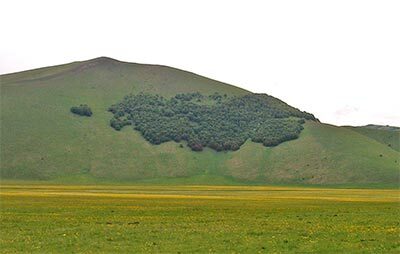 Our destination is the Castelluccio Valley, where in June we are expecting to see a profusion of blue flowers. These flowers are the flowering lenticche, famous all over the world for this legume. Follow the signs to Viso, and get out and walk around the town. Here we stop at a bar for a cafe, and are directed to a special norcheneria on a side street, where we purchase local sheep cheese, known as pecorino, and the local sausage, Ciauscolo, a spreadable big sausage that is famous as a local delicacy. We also purchase lentiche, tiny green lentils, from the Castelluccio Valley, because Giovanna explains that if we wait until arriving in the village of Castellucia they will be more expensive. This is as good a time as any to explain the term Norceneria. Years ago (tanti anni fa), actually during the 17th century, pork butchers from the area around Norcia traveled to Rome with their local sausages and pork products. They were known as Norcerini. When opening little shops for their wares, the shops were categorized as Norcenerias. To this day, butcher shops in many Italian towns also have a sign indicating that they are also Norcenerias, or butchers of pork products. After leaving Visso, we follow the signs to Castelluccia. This is a tiny hilltop hamlet in the center of the valley. However, this semi-abandoned village does not have open stores or areas of particular interest, with the exception of the extraordinary view of the valley. We have been on a very winding but beautiful road, with views of the valley on our left. 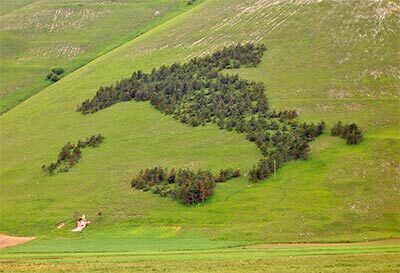 While blithely driving along, we look to our right and see, far beyond us, trees planted in the shape of...ITALIA! on a green meadow. We have to stop to take a picture. Just a little further to our left we can see trees planted in the shapes of North America, then further to our left, Africa, and much further left, Australia! Staying on this road, we follow along and enjoy the view for about 40 minutes to Norcia, where we stop for pranzo at Ristorante Granaro del Monte. We ask to sit in the small room with the fireplace. I cannot resist the zuppa di lentiche, a delightful creamy soup. We are served complementary toasted bread with salt and an excellent olive oil. The fireplace is used as a grill, and grilled meats are a specialty. Roy orders the trout with prosciutto and formaggio, which we don't recommend, but Duccio's risotto with black truffles is perfectly cooked, which he follows with a mixed grill of pork chop and sausages. Giovanna's papparadelle with a tomato and fresh ricotta sauce is delightful. I opt for a small plate of pecorino cheese. Don't pass up on the desserts, including a fluffy torte of lentils and sweet cream, custard with local berries or a creamy ice cream. We order a little of each, a perfect ending to a great meal, followed by espresso. Norcia is certainly worth a special visit. The original settlement of the ancient town of Norsia is thought to have been founded in the 5th to 4th century B C. and is notable for its low buildings. Major earthquakes have occurred in 1328, 1567, 1703 and 1730.The streets are wide and well paved. Since 1730, however, local authorities have prohibited construction of any building over three stories. Many of these buildings are buttressed with thick walls to protect them from the ravages of earthquakes. Giovanna is amazed to find the cheapest price for lentiche in this town. Shops on every street specialize in pork products, pecorino cheese and different beans. One shop offers the lentiche for as low as 7 euro per kilo. (We previously purchased a half kilo in Visso for 5 euro.) It is in this shop that we are shown a poster of the flowers in bloom, and are told we are three weeks early. Also in this town, just off Piazza San Benedetto, is a chocolateria, specializing in packages of chocolate truffles, great for gifts, for as little as 5,50 euro. While we are in Norcia, there are several churches of note. The church of San Benedetto contains a 14th century door adorned with statues of Benedict and his twin sister, Santa Scholastica. He was the founder of the Benedictine order of monks. There is a legend that Benedict was born here, and the 5th century remains of a crypt are visible by taking the stairs on the left after entering the church. The Duomo, built in 1560, is located across from San Benedetto. Although it has suffered much damage over the centuries, it is worth a look, as is the Palazzo Communale, a monument to the town's period as a free commune during the 13th and 14th centuries. Other religious sites include Sant'agostino on Via Anicia, with frescoes from the 16th century and, in Piazza Palatina, the Oratorio di Sant'Agostinaccio with a remarkable 17th century ceiling. On the drive back, Duccio and Giovanna rave about the Church of Santo Stefano in Ferentillo, above Terni. They tell us about a group of people, whose 18th century remains were found in almost perfect condition, including a few Asians who were working on the building of the church at the time. There is time to take a look. So we stop, and Giovanna and Duccio wait with dog Sofi, while Dino and I buy tickets and walk up to the church. At the door, three young people are standing on scaffolding, restoring the front door. They let us in to a very beautiful church, but there are no mummies here. Duccio finds us to tell us that the building we want to see is below the church. So we walk down the steps and up a few more into a stone entrance to a crypt and the young woman who sold us the tickets is waiting for us. She opens the iron gate, and we are ushered into a very low room, which is the crypt under the church. It is carved in stone with faint frescoes on different walls. But the glass boxes in the center of the long room literally take my breath away. I don't know what I expected, but I think I am going to faint. The glass cases contain mummies from the 18th century, so perfectly preserved that the cases are open at the back to let air inside. The first figure was obviously hanged. From then on, I can hardly believe my eyes. At the back of the room are more than fifty skulls. Leaving there, we continue our drive back down the S209, see the falls our left and continue on through the streets of Terni, to the superstrada toward Orte. We continue on the Superstrada to the Bomarzo exit and then we are home.